This post is a review of Thrive Leads. So, what is it? Thrive Leads is a lead generation plugin that works quite well for WordPress. It is an all in one tool that you can use to get email subscriptions. BIG HINT: Now, here’s something that we need to emphasize right here, right now—Thrive Leads won’t those emails for you. It’s not email marketing service. It’s just a plugin but it will make getting subscribers a lot easier. Thrive Leads has become an inevitable part of my online business. When list building seems to be a big thing for a novice like me a few years back, Thrive Leads was there to rescue. Not so many plugins are available in the market, the ones available in the WordPress repository for free won't offer many features. If you ask any marketer, what is the best list building plugin you used five years back, the answer will be NO. Thrive Leads was launched at the right time and it becomes widely popular within a short span of time. In this Thrive Leads Review, I talk how to use Thrive Leads for advanced list building, generate sales to your affiliate products and probably every other thing you can do with this ultimate List Building Plugin for WordPress. The company describes Thrive Leads as "Thrive Leads is your all-in-one email list building tool. Create and freely design every type of opt-in form, run A/B tests and grow your list faster than ever before." 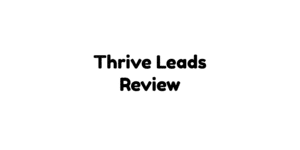 When you finish reading this Thrive Leads Review, you can understand whether the plugin works as promised! The following are the big features that set Thrive Leads apart from other plugins available elsewhere. Note that there is some email list marketing plugins that may offer one or two similar features but they don’t have a package that contains pretty much everything that Thrive Leads offers. Other plugins like OptinMonster and apps are simply just way too expensive. If you are on a budget constraint then other competing plugins may just be out reach. The wide variety of plugins that you have access to is just insane. Compare the sheer number of opt-in forms available on Thrive Leads with other plugins then you will see why this plugin beats the competition—combine that with the competitive pricing of this plugin then you have a clear winner. So, how do you use these forms? I directly take you to the part of how Thrive Leads Works. Once you get an account through this exclusive link, download the plugin from your Thrive dashboard and upload to your site. Once uploaded, activate the plugin and follow this Thrive Leads advanced tutorials. For this Thrive Leads Review, I choose Post Footer since its one of the most commonly used optin type of top websites over the world. Now you need to choose the design, click ADD button and give a name to the design. Now you can see the Edit option, click it and the Thrive Leads editor opens up. There are 80 predesigned forms, choose one and you can design whatever comes in your mind and this how this awesome Thrive Leads looks like very similar to Architect and its complete front end editing, unlike most plugins which just says we offer front end editing. Once designed, click on the email box and you'll get the option to connect with your Email Marketing service. I suggest you go with Mailerlite or MailChimp (both free) and enter the API, the plugin will show the existing list groups you've created with your Email Marketing provider. Or Reaching a particular field. Now you just need to choose where to display the form. This is a next level of targeting which you can find only with Thrive Leads (Other plugins offers similar features charges $49/month while Thrive Leads comes with just $67 with lifetime updates. You can follow the above tutorials to create forms with other types like Ribbon, screen filler, scroll mat, slide in, widget, in content etc. You can check this Thrive Leads Demo page created by me where you can check the complete demo of Thrive Leads. My next favorite option is Leads Shortcode. You can design any type of forms and you just need to enter the shortcode at places where you want to show the form. For example, I placed a Lead shortcode at this post where I want to show the form immediately after first 100 words. Another stunning feature which made me recommend Thrive Leads as the Best List Building plugin for WordPress. Few years, not such predesigned two-step optins available in the market and one need to hire a developer to make such custom optins. After making any one of these forms you can use them for A/B testing—which is how can find out if a copy works or not and which copy works best for what. You can also use it to target specific customers or leads. You can also use them to display according to certain triggers. This is probably one of the biggest things where Thrive Leads can help you with. It has almost become a cliché when people say that the money is in your mailing list. However, you can’t just make that money or that list if you don’t know which copy works and which one doesn’t, right? 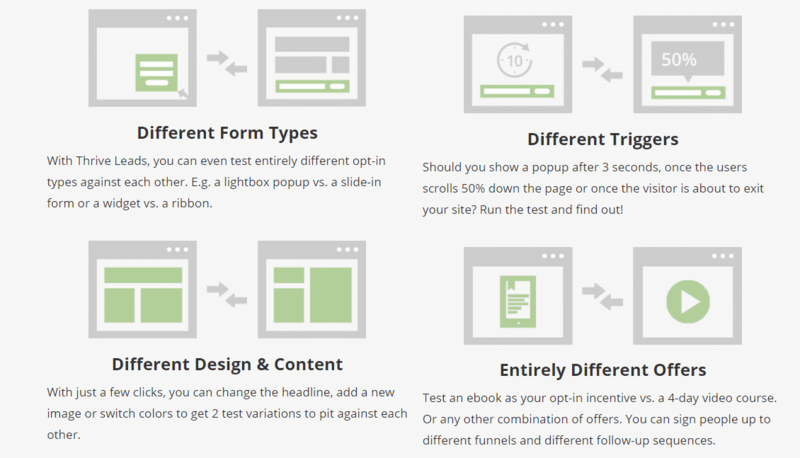 The A/B testing feature of this plugin allows you to optimize the opt-in forms that you use. How does it do that? This testing feature allows you to compare one form with another or compare one version of an opt-in form to another version. That way you can fine tune each form until you can get the best version that works for your particular campaign. This means that you can test a lot of things within your content. For instance, you can use Thrive Leads to test if a certain popup works better when it is displayed 10 seconds later or maybe it will be better when it is displayed 20 seconds later. Another test that you can perform is to check which screen filler works best. You can test if a screen-filler will get more results or if a slide-in (which is less obtrusive) works better. Thrive Leads also comes with asset delivery features. These you can use to create lead magnets. You can add these lead magnets to help provide downloads to your subscribers automatically. This is somewhat a rather unique feature for a WordPress plugin. Now, if you already have subscribers you don’t want to bombard them too much with offers that it will eventually end up annoying them. If they do get annoyed then you may end up losing people who are already on your list. Well, come on—they have already subscribed to your mail list, why put links that asks them to subscribe all over again? It doesn’t make sense. Thrive Leads allows helps you avoid all that. The SmartLinks feature allows you to display different kinds of offers to your subscribers. Well, it’s either you offer something new or your page just delivers the content that your subscribers are looking for minus any offers that can annoy them. What are SmartLinks? SmartLinks are basically links that you can add to your emails that can hide or unhide your opt-in offers. Well, you have a choice to either hide your opt-ins completely or just display a different opt-in instead. The following are the advanced features that you can find in the Thrive Leads plugin. Note that not everyone will use all of them. In fact, there are webmasters who have rarely used them at all. However, these are the tools that may come in handy someday. They’re one of those things that fall under the “it’s better to have them and not need them than need them and not have them” category. Note that these advanced features are still worth exploring. Some of them may even help you do your list marketing a lot easier. The content marketing report feature allows you to see which of your posts are getting lower opt-in rates and which ones are performing better. I hope you can already see how useful this feature can be. With this reporting tool you can identify which posts need to be edited or updated. Now, as a bit of fair warning there is a downside to this tool. Ready for it? It takes a bit of a while for it to load. No, it’s not your internet connection that’s problematic. It’s just that this tool simply takes a lot of time to analyse things and post them on your screen. This tool allows you to make one click signup links. This makes getting new signups a lot easier. If you have affiliates then you can give them these click signup links to make their jobs a lot easier. 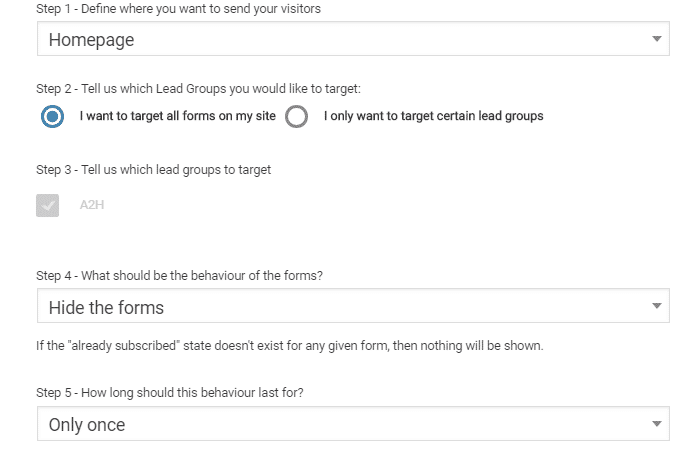 Go to lead groups and create a lead group and then follow the prompts to add a form type. Thrive Leads is an economical mail list marketing plugin for WordPress. I highly recommend it especially if you are having trouble building your list. Everything is localized to one installation of WordPress. You will have to reinstall the plugin to different websites. All the details can be a bit confusing the first few times you try it. There are just so many options. It takes some practice to actually learn it all.